Recently I decided to learn more about digital methods for creating good black-and-white photographs. I looked around on Amazon and after reading quite a few descriptions and readers’ opinions, I ordered three books. 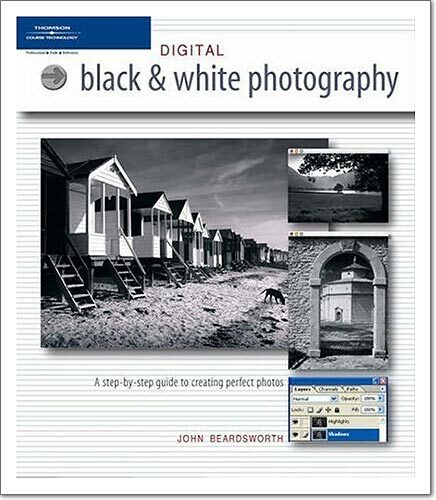 I’ve now finished reading the first one: Digital Black and White Photography / A step-by-step guide to creating perfect photos by John Beardsworth. Even though I didn’t learn much from it, I’d say it’s a nice introductory text to photography, image composition, digital editing, black-and-white conversion, several Photoshop effects, and presentation of digital images. Despite the subtitle’s claim that the book is a “step-by-step guide to creating perfect photos,” all topics are treated at a relatively basic level. But this is not necessarily a bad thing — like I said, the text is probably very good for beginners. The book presents virtually all topics on exactly two pages, the only exceptions being “converting color to black and white” (6 pages) and “optimizing tonal range” (4 pages). Each pair of pages contains 5 to 7 images, a short explanation for each image and 4 or 5 short paragraphs with the main text. One probably cannot learn very much from such short texts, but you’d be surprised by how much information fits on two pages, especially when the accompanying images are carefully selected. Whenever necessary, the book shows a screenshot of a Photoshop dialog or of the layers palette. Digital Black and White Photography starts with 14 pages dedicated to the (digital) camera, lenses, focusing, exposure and flash and follows with 34 pages on composition, learning to see and on light quality. The section is entitled “how to shoot great black and white photos,” but the material applies equally well to color photography. The next section is “digital imaging techniques,” and that’s where most of the interesting stuff is. Unless you know quite a bit about the digital workflow, you’ll probably learn a good bit from these 34 pages. Even Russel Brown’s two-layer technique for converting to black and white is explained, although the name “Russel Brown” is never mentioned (but who knows who really invented the technique anyway). The book continues with 22 pages dedicated to “simulating classic darkroom effects” where you learn how to emulate sepia toning, split toning, infra-red film and how to darken the image borders. You also learn about hand-coloration, bas relief and solarization, but I doubt that anyone really needs these techniques. The closing chapter is titled “showing and sharing your pictures” and uses 14 pages to briefly touch on monitor and printer calibration, paper and ink types, creating a slideshow and burning it on a CD-ROM, creating a presentation and burning it on a DVD, and uploading images onto a web-server. All these are treated very briefly, but at least the reader is made aware of the possibilities and is encouraged to look for further information. The book is printed very well (not quite like a fine-art book, but much better than a textbook), and if you are a relative beginner, it’s probably well worth its price. However be aware that it contains very little content dedicated exclusively to black and white. Then again, if you know how to use your equipment, know something about image composition and about digital editing, it will be very hard to find any book that teaches you something new with every page.